I hope your all well and happy. So a few weeks ago whilst on holiday in Dubai, I booked into The Dollhouse salon. It is a full service salon, owned by the very beautiful Mona Kattan and Basma Al Fahim. 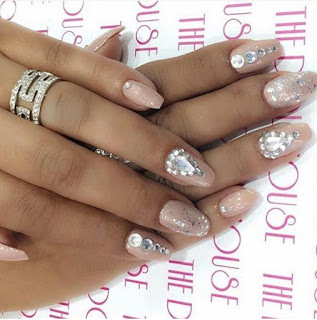 They have a huge social media presence, I have followed Dollhouse on Instagram and have desired for a long time to have my nails done from them. So I emailed the team from the UK and got a very speedy response, they asked me which service I would like to book in for and from just the emails I felt valued a bit like a VIP. They were very helpful and friendly. I was now super excited to go and kept going on line to get inspiration for the nails I would like. The day finally arrived, I woke up at the beautiful Al Qasr hotel, had yummy breakfast, left Mimi and the hubby at the pool and made my way to The Dollhouse. I had a private taxi booked to ferry me, well the driver didn't know Dubai too well and kept getting lost. I was getting frustrated as he was delaying me, so I rang Dollhouse. They were so calming and gave clear and concise directions, however he got lost again. By now I was really stressed and agitated. Rang Dollhouse again, they spoke to the driver and finally the ball dropped and we arrived at The Dollhouse. The staff I must say at Dollhouse had already made quite an impression on me just via emails and phones. As I walked from the car park towards the Dubai Ladies Clubs building, I felt elated, I was finally going to THE DOLLHOUSE. As I stepped out of the heat into the refuge of the cool building I was super excited like a child on Christmas morning. When I walked up and saw The Dollhouse sign lit in pink I was like wow I am here yay. I was busy snapping and taking pics as I wanted to document it all. I was promptly greeted by my name and taken over to the pedicure chair. From the pictures i had imagined Dollhouse to be a very big space, in real life it was more quaint and cosy. The decor is beautifully opulent and the atmosphere felt soothing, calming and very friendly. I was a bit apprehensive about the pedicure chairs, as they are tub chairs and I feared they may not be comfortable. To my surprise they were very agreeable with my bad back. I was asked if I would like a drink, I asked for a black tea but I was given a black coffee, easy mistake that was rectified immediately. So lets get down to the treatments, I was booked in for a paraffin foot pedicure and a nails. They have individual heated paraffin bags, which is so much more hygienic method then the traditional double dipping, as it used only once per client. The lady doing my manicure suggested I have it on my hands too, I had been suffering form dry skin so thought yes why not. After the treatments my hands and feet felt brand new, I felt delighted at the results.The pedicure and manicure commenced, I even had my eyebrows done. Ar one point I had four members of staff attending me. I felt like royalty, it was all so incredible. My bling nails were done to perfection, they are still going strong after 3 weeks. Once all the treatments had been done I finally got to place my hands on the dollhouse paper! I was beyond excited and took a zillion pictures with my hand on the paper. 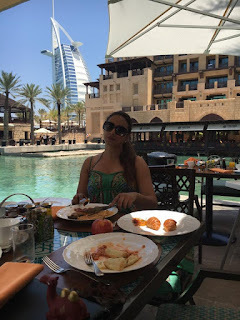 I would just like to say Dubai is renowned for her service levels, hence the reason my husband and I return there time and time again, The Dollhouse ladies surpassed that from the very first email. If you ever visit Dubai you simply have to drop by The Dollhouse, it should be a landmark like the Burj a must see. Do you like my bling nails? Omg! I have always wanted to go to the Dollhouse if ever I go to Dubai will go there for sure. Wow, I would like to visit this place asap!!! Looks like you had some intense pampering there! Your nails turned out gorgeous! 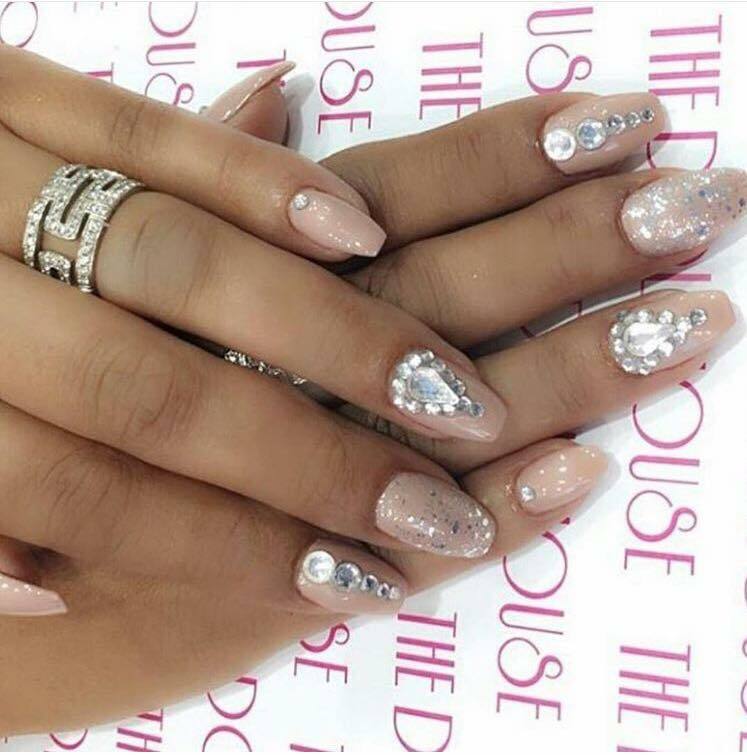 omg the nails look fab. You are so lucky.We hardly have these kind of staff here in salons who make you feel special.